If someone were to ask you what is your Spanish level, what would you say? Beginner? Intermediate? Fluent? Three years of high school Spanish? What does that really mean? (In my case, almost nothing). It turns out, having a commonly adopted and specific definition of Spanish levels can be quite helpful. And in Europe, they have just that. 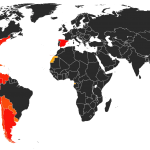 Americans who come to Europe to learn a language are often surprised by their first encounter with the European alpha-numeric system for Spanish levels. I became a convert almost immediately. It’s ordered, specific, and simple with little ambiguity, and its nomenclature is easier to adopt then other lesser-known guidelines that exist in the US. The table above has been adapted and simplified from the original version which includes more specific assessment. If you’re really curious and have some time on your hands, you can download the official document with the level descriptions here or visit the Council of Europe website. Having six well defined levels provides a map for your progress, so you know where you are, where you’ve been, and where you are going, in terms of your Spanish language acquisition. Some levels you will progress through faster than others, but you can see what’s expected of you at each level, which allows you to measure your progress – an important motivation for learning languages. Thus, it is not always the case that you will have the same score in each area. 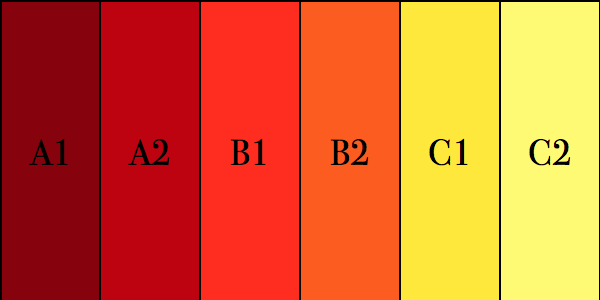 For instance, you may be B1 in writing, but A2 in speaking, or vice versa. However, typically discrepancies among ability do not differ by more than 1 level. Lastly, if you are looking to get an official certification of your Spanish competency, the DELE test (the official accreditation in Spain) requires you to choose the Spanish level in which you want to test for. There are 6 different test levels (A1-C2) and the test are given throughout the year at different times. 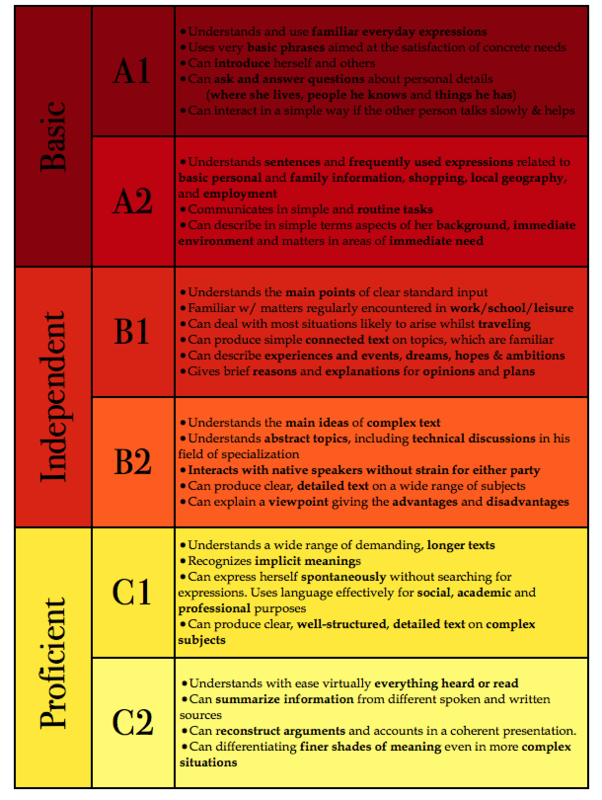 Now that you know the European Spanish levels, check the guidelines to determine your own level or baseline. 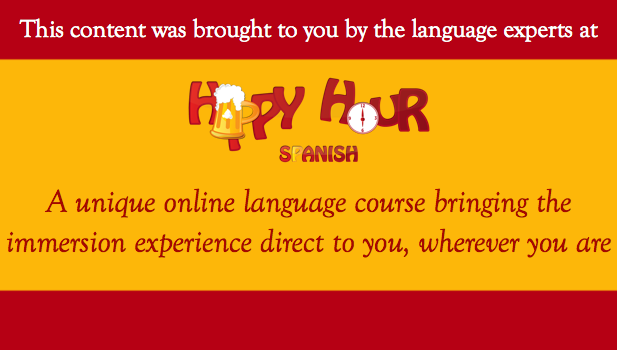 At Happy Hour Spanish we’re developing an assessment test, but for you can also try one of the many free tests online like at Cervantes or Spanishtest.net. In addition, the video course content we’ve created at Happy Hour is based on CEFR specifications for concepts typically taught in each level. Check out our current course offering and try the first lesson in every level free. We also have a common list of proficiency levels in the United States. Check out ACTFLs Oral Proficiency Interview and the levels of Novice, Intermediate, Advanced, and Superior, as well as three sub levels for each of Low, Mid and High.